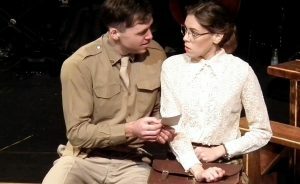 It’s been nearly 30 years since World War Two drama, Somewhere In England, was performed on the public stage and, then, its run by an amateur group from Ealing, lasted just one week. But it’s a story that is so familiar to us all. It’s been endlessly replicated in plays and on screen. You know the one. It’s the start of the war and our brave boys have been sent off to fight only to be replaced by those damned Yanks. They’re loud, crew-cut cowboys from Texas, Boston and every other of the 50 states of America and they’re now over here, over-paid and over-sexed. Billeted in camps around the UK the GIs try to make friends – particularly with the girls whose boyfriends are now fighting for king and country – only to be rebuffed by some and welcomed with open arms by others. Gordon Caleb’s musical, Somewhere In England (not to be confused with Polly Wiseman’s non-musical version which is almost identical) has been revived by one of its former Land Girls, Sheila Daniels, for what has turned out to be a week-long sellout run at the New Wimbledon Studio. It features some fine performances, particularly from its younger cast members, though suffered a few wobbles at Tuesday’s opening night, with weak singing by some. None of its songs are memorable, the sort that will stick in the brain and you’ll hum on the way home, but they do integrate nicely into the story (book written by Gordon’s wife Jean). In The Country and We Wanna Go Back Home, sung by the entire company, epitomises the two faces of war with the Brits yearning to save their tranquil way of life and the rowdy soldiers homesick. At its heart is a tale of hope, friendship and love amid the horrors of war. GIs Joe, Chuck and Elmer are looking for female companionship but nothing is straight-forward. The vicar (Tony Barber, who appeared in the original production) arranges a get-together for the new arrivals to meet the villagers. Over tea and scones the handsome, affable Joe (newcomer Ryan Ferrie) sets his cap at Phyllis whose boyfriend is away fighting, while the cheeky Chuck finds himself unexpectedly drawn to the buttoned-up, very straight-laced, school ma’am, Marjorie (Stephanie De Whalley). Innocent abroad, Elmer, is attracted to the flirtatious London Land Girl, Eva, but she has eyes for everyone in a pair of khaki slacks. Footloose and fancy free, she’s determined to have a good time. The will-they, won’t-they scenario brings success for some and not others. In-between there is a bit of silly (and unnecessary) business with a comedy couple protesting at the Americans’ tour of duty. The highlights are The Forty Four, a big dance number which finishes the first act, and Do It For Uncle Sam! in the second. 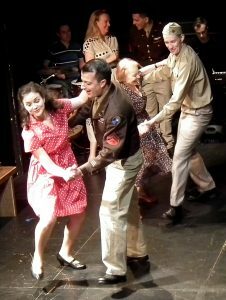 Aaron Jenson, as Elmer, proves to be more of a dancer than a singer, with some elegant moves choreographed by Madeline Eaton-Belton. Fed Zanni, who plays the boys’ sergeant, has a superb singing voice which props up most of the ensemble numbers. It’s a disappointment there isn’t room for a solo. The girls are beautifully played by Hannah Ponting as Eva, Kluane Saunders as Phyllis and De Whalley. Eva is spirited and ephemeral; Phyllis, serious and complex, is consumed by guilt at wanting Joe, and the lovely Marjorie epitomises hope and happiness. What lets Somewhere In England down is the quality of the play itself. This really is a show best suited for the amateur stage. It is predictable and unremarkable, the dialogue is stilted and it features stock characters from central casting. What it does do, however, is showcase some outstanding future talent. Sam Landon is superb as Chuck who reveals himself to be a far deeper character than he is initially given credit for. It’s a subtle, well-measured and compelling performance. Plus Ferrie, the young female leads and the more experienced Zanni are all names to look out for in years to come. Somewhere In England runs at the New Wimbledon Studio until Saturday. WWII drama, Somewhere In England, showcases future talent but suffers from a clichéd, overworked story that lacks any originality.